Not to get all “Gloria Steinem” on you all here, but women pretty well hold the power to changing the world, or at least our food system. I remember that we women rock a few impressive numbers ourselves. We make 93 percent of food purchase decisions for our families (meaning the foods we purchase to serve at home). Yep, even with the kids nagging us, it’s still our decision. As nutritional gatekeepers, we control at least 70 percent of the foods our families eat. While our kids may make other choices at school lunch, or out with friends, or by other parents after a soccer game, our share ends up being nearly three-quarters of the food choices. I remember that all those companies are nothing without our consumer dollars. While “vote with your fork” is probably one of the least democratic polls we can have in our country due to economics and food access, for those of us who can choose our foods, it is a pretty amazing power. The hope is that we choose wisely and the food system as a whole becomes healthier for all. I also remember, that its not easy to know which choices are best. This is deliberate, too. Labels are confusing and misleading. Things that are NOT labeled (and should be) are confusing. 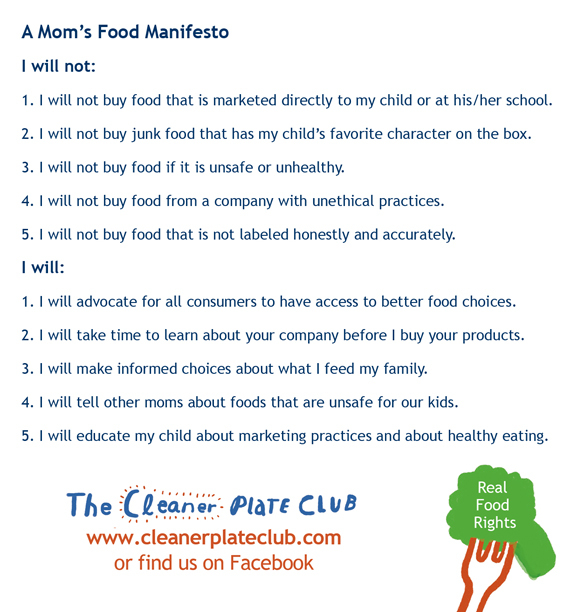 After over a decade of trying to figure out the food system, I basically have arrived at Ten Simple Rules — A Mom’s Food Manifesto — for making good food choices. Here it is. Please share it, at will, with others if you like them. And go wield your awesome powers, Moms. We can win this war. As far as the rest of our superpowers go? We can take on the rest of the world once we know our kids are eating healthy. We moms get a lot of surprises in our lives. Everything from "projectile launch" by a kid with stomach flu on Christmas morning to trying to identify what the dog just ate from the scraps on the floor (a Christmas ornament, really?). Can we handle being ambushed by broccoli, too? You bet! While the CSA, or community supported agriculture, box may hold a few new veggies for everyone, the fact is most fruits and veggies do have a certain season where they make their annual appearance. We've just lost track of it amidst the grapes from Chile in April and the tomatoes from Mexico in February. The seasonal guide from our book can help you plan ahead enough to give you some comfort factor — knowing things may vary a week or two depending on how soon spring is sprung each year. Here is a basic list, not including many of the wonderful surprises a CSA can offer. Some surprises can be good! Look for the resources and links at the end of the list for further reading on CSAs! First of all, THANKS to all the parents who voluntarily spent an hour with me at the Local Food Expo. I did see one guy nodding off, but I get that, I have a very soft voice. In fact, I used to read myself to sleep first while trying to get the kid down for a nap. Heh. We had a lot of questions and great discussion. I did promise to post a few of the follow up links here, and I like to keep promises! Plus, you can roast and chill beets, adding them to a smoothie (blueberries with cherry juice work great), dice into salads especially with citrus and fennel, add shredded to a red cabbage salad, and as I mentioned in our book, you can even put them (not pureed or stealthy) into brownies. You can also dye Easter eggs with them. The handout I had was on making a risotto for all seasons. But other techniques can help you use nearly everything in the CSA box that is, uh, "cook-able." Roasting is a perfect technique. The book specifically calls out Roasted Asparagus and Green Beans. The key here is quick cooking items like tomatoes you can roast at higher heat and short times. For the more dense veggies like pumpkin or sweet potatoes, use a lower temperature and longer time so the veggie cooks through without burning on the outsides. A bit of olive oil, salt and pepper plus time and heat equals side dish. As a ballpark guide, this will give you a starting point. Just peek at the food, test, and customize for your oven's "quirks." For the adventurous, outdoor-cooking types, grilling and, yes, smoking of vegetables is fun to try. Other veggies that are amazing smoked: tomatoes, corn, peppers, okra, even winter squashes. And these guest posts on Dr. Greene are a fantastic resource for the control, color, texture, taste issues. Scroll down below the author photo and bio, please without thinking, "wow, she did not look like that in person." I was very tired and it showed. We also talked a bit about using fun away from the table to get kids to eat better. And finally, if you are just stressed, stop by and read this interview I did with a feeding therapist on his 20-year career. If I missed any questions or follow up, just ask me. 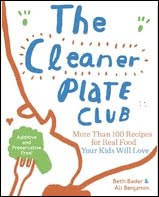 You can reach me on our Facebook page, or by email at thecleanerplate [at] gmail [dot] com.